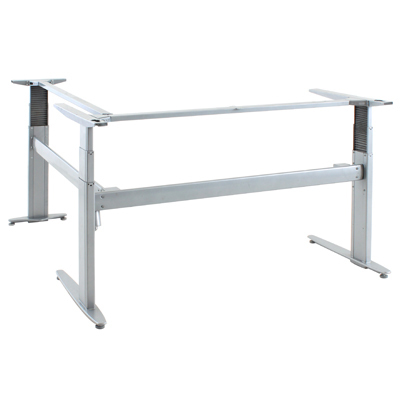 The 501-27 Series from Conset allows your entire workstation to raise and lower easily and quickly at the touch of a button, offering a cost effective solution for sit/stand or multiple-user workstations. 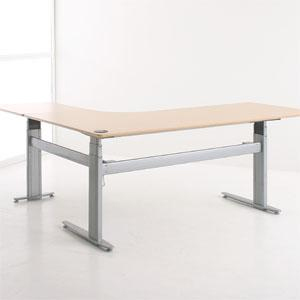 The 3-Leg Triple Nested Column design provides significantly more stability than any 2-Leg base throughout the full 26" range of movement, as the third leg also serves to brace the desk. The height adjusts from 21" to 47" at a rate of 1.2" per second, with a lift capacity of 220 lb. An Anti-Squeeze Protection System will automatically engage if the resistance increases noticeably while moving down. 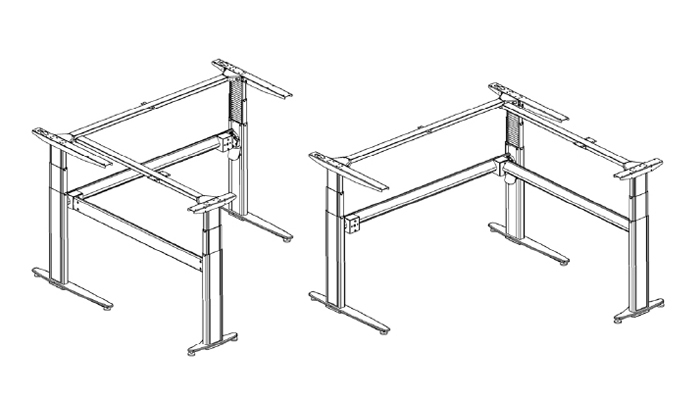 The 3-Leg model is suitable for an "L" shaped workstation, the base having a 59 13/16" wide front and 56.875" wide return. With this base either a custom-made or pre-existing table top can be used (provided the dimensions are of sufficient size) or Conset's own 72-48SB and 24-24SB can be purchased (these are designed to work together in conjunction with this base to provide an "L" shaped table top). The entire base is powder coated in an attractive silver color. To find out which tabletops are compatible with this base, consult our base/tabletop compatibility chart. Multiple Working Postures - The 501-27 electric height-adjustable frames enable users to sit, lean or stand during their daily work. Transitioning between these positions encourages greater activity in the work place, bringing associated health benefits as workers are able to move away from a completely sedentary environment. Infinitely Adjustable, Effortless Height Adjustment - The base provides infinite adjustment of height from 21 1/4" to 46 7/8", allowing users to quickly and precisely adjust the height of the worksurface to the optimal height for the desired workstation configuration (sitting, standing, or anything in-between). Accommodates Nearly All Users - The range of adjustment is sufficient to accommodate even very tall individuals, sitting or standing, up to 6' 4". Attractive Modern Styling: The slim legs have contemporary styling and are powder coated in an attractive Silver or Black. Dual Safety Switch: There are two switches (one activation switch and one toggle switch) which must be depressed simultaneously to adjust the height. This design ensures that any change in height requires a conscious action by the operator. Accidental triggering of the height adjustment mechanism cannot occur if only one switch is activated. 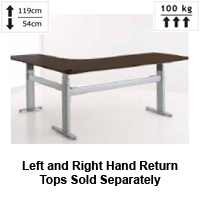 Anti-Squeeze Safety Feature: If the table top meets an obstacle while moving downward, the desk frame will stop. The pressure given before stopping is equal to the weight of the table top and the items placed on it. Triple Nesting Columns: The nested telescoping legs provide over 25.5" of height adjustment with minimal effect on stability even when at maximum height. Adjustable Feet: The base includes adjustable feet which can be adjusted to ensure the base is level and to compensate for imperfections of the floor. EN 527-3: Office Furniture - Workplaces and Desks - Part 3: Methods of test for the determination of the stability and mechanical strength of the structure. Height Range: 21-1/4" to 46-7/8"
Width (Top of Legs): 2-3/16"
Estimated Assembly Time: 45 minutes - 1 hour (2 persons recommended). Mounting a top to the frame should take no more than 10 - 15 minutes. Tools Required: Allen Wrench (included). Installation of top and control panel will require a Phillips screwdriver. Note: Always ensure that screws used for mounting the top are of appropriate length. Don't stand for too long. Certainly in the initial period, limit your standing to 15 to 20 minutes per session unless you are already used to extended standing. Switch! Set a notification on your computer or phone to remind you to switch between sitting and standing on a regular basis. Doing so will help you develop the habit of switching throughout the day. Don't just stand there! Try to consciously use your leg and core muscles as you stand. Allow your body to shift and especially make a point of moving and flexing your leg muscles. By doing so, you encourage healthy blood flow in the lower legs. This can help you avoid the problems that can arise when people stand for a long time without moving. Be sure to consider your height as you position your desk. Be aware that the height of your heels and even the time of day will affect your standing height. (Everyone is a tiny fraction shorter at the end of the day than they are in the morning.) Ensure that you adjust the desk accordingly to achieve a neutral posture. Try to avoid high heels if you plan to stand while you work. These will tire your feet and increase the risk of damage to the structures of your feet and lower leg. Consider an anti-fatigue mat. Many users find that standing is actually tiring, especially so with the hard surfaced floors on which most people work. The short pile carpet that is common in many office or retail environments does little to mitigate the rigidity of the concrete it usually covers. A good anti-fatigue mat can leave you much less fatigued at the end of the day as it encourages flexing of the feet and lower leg muscles. If you wish to regularly switch between standing and sitting you will want a mat which can be easily moved when transitioning between the two positions. Consider the anti-fatigue mat by Let's Gel, or the anti-fatigue mat by IOC Innovations. Try leaning. If you discover that you like working in an upright position but find that extended standing fatigues your body you may wish to consider one of the many seating options designed for working at elevated desks. These reduce the load on your feet by letting you transfer the majority of your weight to the seat. The “almost upright” stance provides most of the mobility and range of movement that standing offers, while reducing the risk of fatigue. The leaning position also helps you transition effortlessly to a standing position. For available options, visit our Seating for Sit-Stand Workstations category.